Pork rinds are pickled strips of tough yet supple hog skin, cut in various shapes and colored in various hues and patterns. Used chiefly for largemouth bass, pickerel, and pike, pork rinds (sometimes called pork strips) undulate enticingly when slowly retrieved, and a skilled fisherman can make a pork rind look very much like a living creature. Because the rinds are so tough, they can be used over and over, even after a toothy fish has gnawed on it. Pork rinds are fun to fish in weedy areas on a weedless hook, as you can make it look like an injured minnow one moment and a distressed frog the next. 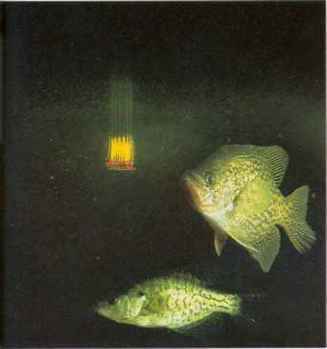 Pork rinds are also used as trailers on some fishing lures (covered in the next chapter). Stinkbaits are also sold commercially. Some relatively new baits in this category, which previously was the sole court of carp and catfish anglers, are meant for other species. These moldable baits resemble nothing in nature but are designed to be attractive to specific species. Many of them are targeted toward trout fishermen, and are scented with ingredients that trout supposedly like. The actual ingredients are a trade secret, but they do catch fish. Fish these moldable baits as you would worms. 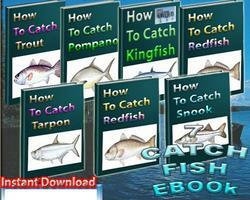 Fish scents aren't baits themselves but are used in conjunction with many baits and lures. As with moldable baits, these scentswhich you spray, drip, or smear onto your baitcontain certain ingredients that fish respond to. The theory is that your worm, say, is more likely to be found and eaten by a fish if you apply scent to it. Do they work? Maybe. I don't know if a trout will find a garlic-flavored worm more attractive than a plain one (to say nothing of the fact that the scent is bound to wash off sooner or later). But if there is one advantage to using scents, it's that it will hide or overcome a disagreeable odor that the angler might involuntarily get on the baitgasoline, for instance, or even just perspiration.